It comes to receive a vespine attack in autumn when a Japanese bee is bred. A Japanese bee runs away when a vespine attack is intense. Then, a vespine trap was produced, and the sticking board for vespine capture was set up. 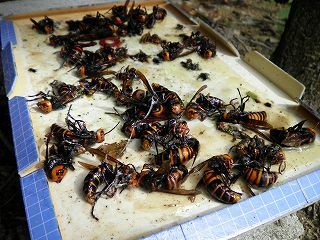 A Japanese bee that is alive in hills and fields in Japan as the wild can kill natural enemy's vespid in the group because of heat. However, it is usual that the ability to collect honey is not so high but value as the domestic animal is low. However, the taste of peculiar honey that differs from the West bee is very popular among the lovers. When a Japanese bee is kept, making to the size in which the vespid doesn't put the entrance of nest-box is usual. The entrance of nest-box is made the width of 6-7mm. When it is 7mm or more, it is necessary to do the vespine invasion prevention to the entrance in the nest. The vespine invitation trap is produced with the PET bottle. Large PET bottles of 1.5 liters or 2 liters were processed, and a vespine trap was made as shown in this photograph. The incision is radially put on the PET bottle with scissors by about 16. Next, this incision part is bent internally. The size is not suitably cared about. The vespid that entered the inside cannot go out easily once. 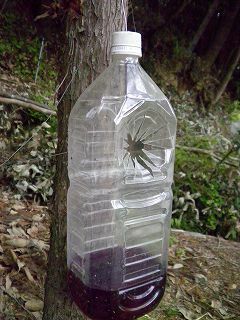 An inside liquid is 1 as for the juice of 100 percent (Anything is not cared in case of not being though the juice of the grape seems to be good) and the shochu (It is sake in case of not being): It puts it at the rate in 1st place. Sugar and vinegar are suitably taken. Abounding about the shochu or sake seems to be better. The vespid enters like interest when this begins to enter, too. It enters a vespine state of fish boiled down with soy in the PET bottle. When a vespine queen is captured in spring, the effects seem to be larger than it captures it in autumn. In this case, the liquid in this trap seems to be too ineffectual in the above-mentioned one. I hear that the liquid in a vespine trap was good the compound of the plum vinegar, the grape vinegar, and the cider vinegar to capture a vespine queen in spring. It is this time the one that tests. It sets it up by the sticking rat capture as a sticking board for vespine capture. It made it to the sticking board for vespine capture by using the sticking rat capture in the hundred-yen store. First of all, the flying vespid is captured with the net. So as not to allow this vespid to die, it applies it to this sticking board gripping it with the long-nose plier. This is put near nest-box. Because the effect of sticking falls when rain hangs, you will put up an easy roof. It hangs on the sticking board like interest one after another when it is a vespid to be alive. The vespid to have died was pulled with the long-nose plier and removed. The West bee might be annihilated by natural enemy's vespid. The bee used to keep bees in our country is the West bee imported at the Meiji era now. Because the West bee doesn't have the defense means to a vespine attack of autumn, it is said that it is difficult to survive in the wild. The West bee doesn't run away generally even if the vespid is attacked. It fights against the vespid until annihilating. It is usual that the West bee doesn't have the means that only being kept as a domestic animal with the nest-box that man prepared survives. However, the ability to collect honey is high, and very excellent as the domestic animal.